Disclosure: I was compensated for this post. The opinions are my own, based on my personal experience with the product. My two boys have definitely inherited my sweet tooth. While I try to limit the amount of sweets in the house, I believe in allowing for treats every now and then. We all received a treat recently when we were given the chance to review the latest flavor from TruMoo – a Limited Edition Chocolate Marshmallow milk. 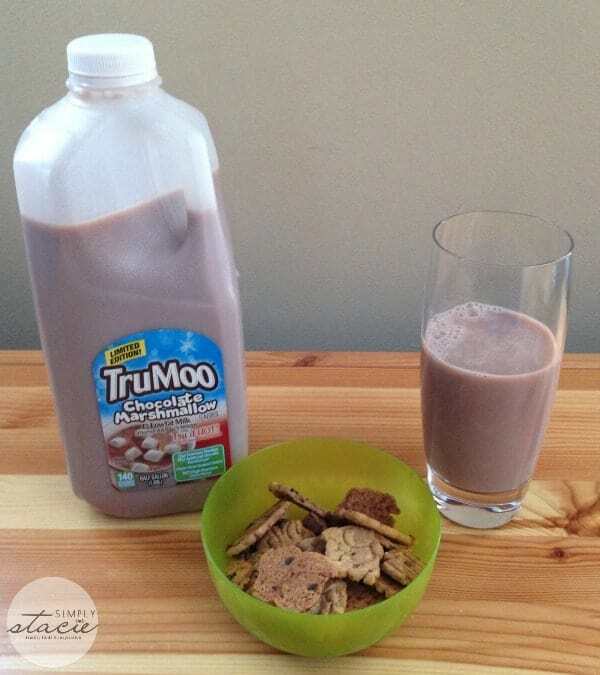 Before this review I hadn’t tried the TruMoo brand of milk, and I was excited to give them a try based on all the good things I’ve read about their chocolate milk products. On top of that list of good things is the fact that they don’t use high fructose corn syrup or artificial growth hormones in their milk products. I also like that it’s packed with calcium and vitamins A and D. Being a fan of hot chocolate myself, I was just as excited as my boys to try this new TruMoo flavor. We decided to sit down one afternoon with one of our favorite movies and a cookie snack to enjoy along with the milk. Both of my boys loved the flavor of this milk and I have to say that I was also really impressed with the flavor and texture. It truly tastes like a cold version of hot chocolate with marshmallows. It was the perfect cold drink to go along with our chocolate chip cookies. What’s neat about this flavor is that it also gives you an easy way to make a cup of hot chocolate on a cold day – all I had to do was put it on my coffee cup and put it in the microwave. No need to boil water or bother with mixes when you have this in the fridge! Most importantly, you can feel good about enjoying this treat with your family – this is a real milk product with nutritional benefits, not just some “chocolate flavored drink”. The Limited Edition Chocolate Marshmallow milk is only available in your local grocery’s dairy case through the month of February 2014, with an MSRP of $2.99 for a half gallon. If you’re a chocolate milk fan, make sure you pick up this flavor for a real treat! You can learn more about TruMoo on their website. You can also find them on Facebook, Twitter, and their blog. oh how interesting.. I bet it’s fabulous! I love milkl….and I love chocolate, but I’m not too sure about this one. I’m guessing it won’t last too long and will have a limited run. What amazes me is that there is no end to new products and the flavours that they can think of. I havent seen this where I live. But, I think my Granddaughter would do backflips for it!! haha Her sweets are limited, but she does get to have treats on occasion. She loves strawberry milk, I think thats her favorite. But, if we could find this in a store around here, it might become her new favorite!!! Im going to keep my eyes open, looking for it. She didnt like some Hello Kitty strawberry hot chocolate that I had for, her, though, so Im totally curious about this… Thank you for the review. Sounds interesting and I am sure it tastes great! Chocolate milk for us is a treat! My son has been so wanting to try this! Maybe I’ll have to give it a try! i’m not a big fan of milk but i would actually love to try this, it sounds so good. This looks yummy. We love chocolate milk in our house and only have it as a treat once in a while. Will have to look out for this!! OMG! I would love to try this! I wonder if it will be sold here in Alberta? This sounds so delicious! I would love to try the new Trumoo Chocolate Milk! I love that it has marshmallow flavor and I can heat this up and have it hot. I would even like this! I can’t wait to find it! Chocolate marshmallow ? Sounds good I must try this. I wish we could get this where I live! This sounds so good!! I have not tried Truemoo milk but this looks delicious! Chocolate Marshmellow?! I hope this is in Canada. sounds interesting, but I think it would be too sweet for me. I tried Tried TruMoo a few times and I loved it! My family really likes it to! Thanks for your awesome review! This sounds like a special treat my kids would enjoy! I’ll have to look for it in stores! Thanks for sharing! This Limited Edition flavor sounds yummy. I haven’t seen this in my area stores (but I haven’t looked for it, either since I didn’t know about it). I’ll have to keep my eyes open & snag a half gallon if it’s available. I have not tried TruMoo yet, but now that they have come out with this cool new flavor, I definitely have to try it. Thank you for this review. ill have to check again, but I havent seen it at my local grocer.. maybe walmart? either way i’m thrilled to try this. it looks and sounds AMAZING! I love hot chocolate with marshmallows! With the weather in my place, this cold version would be perfect! Too bad we don’t have this here. As much as my twins love chocolate milk and their birthday is Thursday – I need to run out and find this! DOES IT HAVE ENOUGH CHOCOLATE FLAVOR TOO??? REALLY CHOCO MILK IS NOT THAT BAD FOR THE KIDS. OR THE MOM LOL. This sounds so good, I’ve got to try this. Would be a good substitute for hot chocolate if heated! O my gooooodness……IM not a huge sweet person, but every now and then-HAVE TO! this would be …dangerous! My grandson loves TruMoo chocolate milk. I bet he would love this one too. We will have to give it a try. It sounds really good. I think my grandson will try it cold and I will try it hot. That way we can try it both ways. I love to try this milk! I love marshmallows and chocolate. 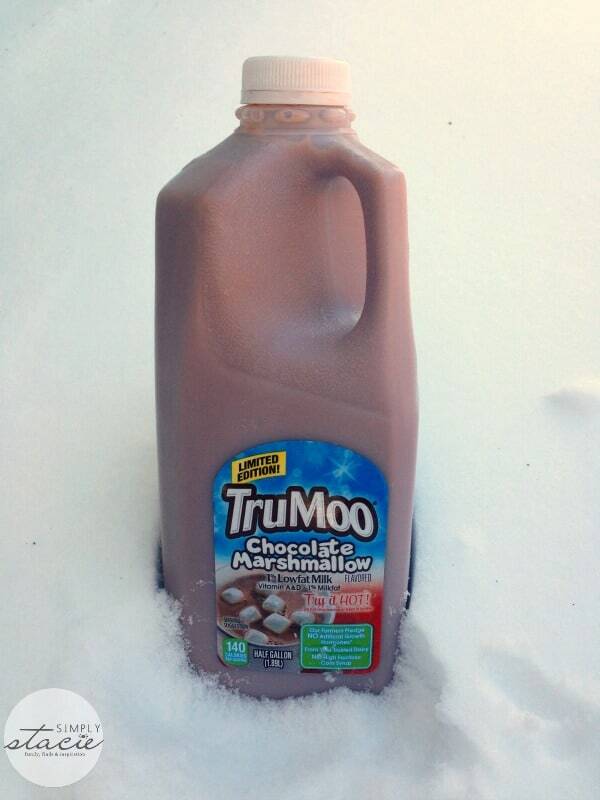 I LOVE TruMoo and who doesn’t love hot chocolate with marshmallows? We have some serious snow in our forecast and I can’t WAIT to add this to our pre-snow shopping list. sounds good, did you try it heated up to see if changes composition and taste? I am going to have to buy this product because I think my son will love it. Sounds like something the kids would go for — big ones as well as the little ones! Hold on…chocolate marshmellow milk?! that sounds amazingly delicious! Wow I know I would love this, especially using it to make hot chocolate which I love. My whole family would drink this milk. This milk looks really good. have to try it ! !